As Women’s History Month begins this week, it is timely to consider women who have shaped our judicial district. 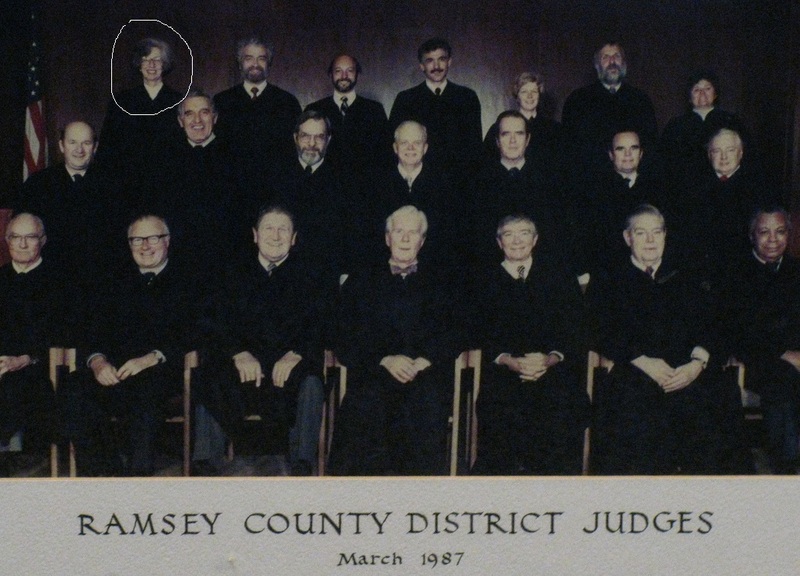 Just as people have noted that our historic judge portrait collection contains no non-white members, it is equally true that the portraits are all of men without a woman in sight. As a child, Mary Louise Klas had wanted to be a lawyer, but this ambition didn’t seem practical when she graduated from the College of St. Catherine in 1952. So she worked in various office jobs until she finally followed her instincts and enrolled at the William Mitchell College of Law, from which she graduated in 1960. She married her classmate Daniel Klas, and they went on to have five children and a successful joint practice of family law. It was this successful work-life balance that inspired a young mother that sat next to her at a political dinner in 1962 to enroll in law school herself. That young mother was none other than Rosalie Wahl. Klas retired from the bench in 2000, but not from passionate advocacy for domestic violence victims. She has continued to be active in organizations including Guild Incorporated, ISAIAH Domestic Violence Task Force, Minnesota Advocates for Human Rights and Minnesota Program Development, Inc.